"Let's Put People on Bikes" is the vision and labor of one man. John Burkitt repairs bikes in a corner of a friend's basement, nestled between the furnace and shelves of old paint. Tunes blaring, he spends hours on each bike. John has worked all over the world for Digital Computer Corporation, Compaq Computer, Hewlett Packard, Teradyne and other companies doing process and environmental engineering. His professional problem-solving skills, environmental emphasis, and interest in social justice meld with his love of bikes in this new venture. In 2009, John used money left to him by his mom to attend the United Bicycle Institute, a bike mechanic school in Ashland, Oregon. 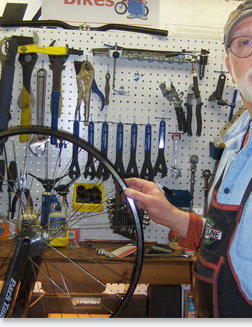 He received his certification in bicycle maintenance and decided to use his new found knowledge to help his community. As a child, John rode his bike all over Batavia, Illinois, from home to school, to swimming at the quarry, to friends' houses. His bike spelled independence. Some 40 years later, he bought another bike. Riding it made him feel like a kid again. Now he rides at every opportunity for recreation, cycle touring and everyday transportation to the grocery store, to church, to meetings, to doctor's appointments, even to Weight Watchers! Sometimes he rides his bike from his house to "The Bike Shop," a 65 minute ride. Recently he rode from Saco, Maine to Amherst, New Hampshire with a friend one-third his age, giving the younger man a run for his money. John would love to hear from you.